Where do these Knicks fit in the pantheon of terrible New York pro sports teams? These Knicks do not yet qualify for a 10-worst-New York-teams-ever list. Check back in April. 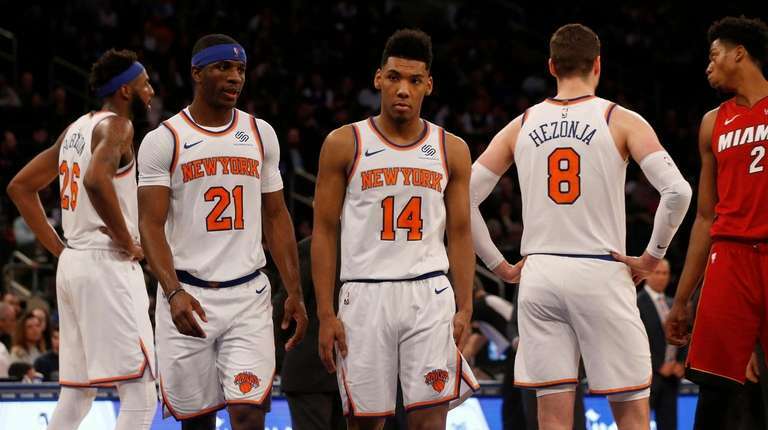 The Knickerbockers officially became the worst team in the NBA this week, their 10-40 record – and .200 winning percentage – alone in 30th place entering Friday night’s game against the Celtics (gasp) on national TV (gasp). Many fans are not unhappy with this development, of course, because of its draft-lottery, ping-pong-ball, Tryin’-for-Zion implications. But still . . . a little embarrassing, no? The historical question is where the 2018-19 Knicks fit in the pantheon of terrible New York pro sports teams. Which team is the worst of the bad New York pro sports teams? Their full story is not yet told. But we can see where this is headed. They have lost 11 in a row and 24 of 26. Clearly, a trend. Still, to be fair, they are not done. So for our purposes, these Knicks do not yet qualify for a 10-worst-New York-teams-ever list. Check back in April. For now, this is what we have. To be clear, our list does not factor in expectations. There have been teams less-bad than these but more disappointing, given preseason hopes and hype. The 2017 Mets come to mind. And the 2017 Giants. They were supposed to be good. No one expected the 1962 Mets or 1972-73 Islanders to be. But bad is bad, and these are the worst. Sure, the 2017 Giants broke these guys’ franchise record for losses, but the ’66 team’s defensive ineptitude en route to a 1-12-1 finish – after opening with a tie – likely never will be matched. They allowed 501 points, a record for a 14-game season, including five games of more than 45 points, and 168 in one three-game stretch! The Jets signed free agent Neil O’Donnell, fresh off a conference title with the Steelers, to succeed Boomer Esiason at quarterback. O’Donnell promptly started 0-6, then suffered a shoulder injury and did not play again. Frank Reich did not fare much better. The Jets would finish 1-15. Exit coach Rich Kotite. Enter Bill Parcells. One must be careful in assessing teams during the World War II years, because sports always were in flux then. Still: This level of badness was something special. The Rangers finished 6-39-5 for 17 points – less than half the next-worst total in the NHL – and were outscored, 310-162. Ken McAuley had a goals-against average of . . . 6.24! Like the ’62 Mets, these guys deserve a break as an expansion team. But there is no arguing against a 12-60-6 record and 347 goals allowed. Billy Harris led the team in scoring with 50 points. Things began to look up the next year when Al Arbour arrived. The year after that, the Islanders eliminated the Rangers in the playoffs. That was quick. The ’92 Mets lost 90 games and inspired a book called “The Worst Team Money Could Buy.” Then the ’93 Mets were worse, losing 103. Bobby Bonilla angrily offered to show a reporter the Bronx. Pitcher Anthony Young went 1-16. Vince Coleman injured fans with a firecracker. Bret Saberhagen shot bleach at reporters with a water gun. The Yankees have had their share of duds, including 1966 and ’90. But nothing the team has done in the past 100 years quite matches 1908, when they were known as both the Highlanders and Yankees. They went 51-103. Cy Young no-hit them in June. Starting catcher Red Kleinow batted .168. That’s lower than Gary Sanchez! There have been Knicks teams with worse records, including the 17-65 mess of 2014-15. But the ’05-06 team took losing to creative levels in finishing 23-59 in Larry Brown’s first and last season as coach. To add to the disappointment, they made an unwise trade for Eddy Curry and spent more on payroll than any other team in the NBA. The 1902 Giants made a bid for the list, going 48-88 the year before John McGraw arrived to right the ship. But these guys went 48-104 – 56 ½ games behind McGraw’s Giants – and were outscored, 807-506. Pitcher Mal Eason went 5-21 and did not even lead the team in losses. Manager Ned Hanlon was fired, and then hired by the Reds! There have been worse Nets teams, including the 2009-10 entry that began 0-18. But that was in New Jersey. This team was coming off an ABA title and flopped in its first NBA season while still playing at Nassau Coliseum. The Nets went 22-60. Did we mention they sold off Julius Erving to the 76ers before the season? That, um, did not help.